Work on PanLex-based word games began in 02016. As of now, no such games have been deployed. Ideas, plans, code, and prototypes are described here. Telephone is a game that lets players explore the PanLex database, discover surprises in it, and thus discover surprises about words. The fact that apparently unrelated words can be linked by chains of translations arises because of ambiguity. This game tests players’ vocabulary knowledge in as many languages as they may know. It may help players improve their vocabularies in languages they know or are learning. It also reveals meanings of words that players may not have known. Finally, it illustrates the need to be skeptical of translations, especially automatic ones. The task in Telephone is to discover translation paths between expressions. The player chooses a language variety. Then the game server prompts the player with 2 expressions, which we’ll call X and Y, both in that language variety. Then the player, on each iteration, chooses among the language varieties into which PanLex has distance-1 translations of X, the server discloses the texts of those translations, and the player chooses 1 of those. That chosen expression then becomes X in the next iteration. The player can “win” by finding a path from the original X to Y. 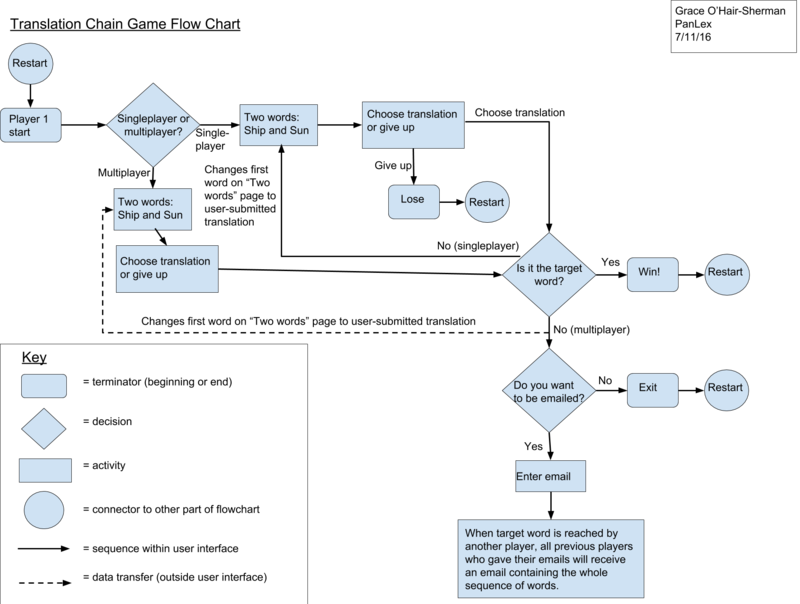 On any iteration, the player may elect to give up. In a single-player version of the game, that causes the player to “lose”. In a multi-player version, other players may play the game independently with the same initial X and Y, and if any of them wins then the game ends and the winning translation path is sent by email to each loser. Password is a 2-player game that lets players cooperatively explore expressions in the PanLex database. The task in Password is for one player, who knows an expression (the “password”), to help the other player guess it. Unlike Telephone, Password operates entirely within a single language variety, so it is suitable for monolingual players. Although it cannot be played solitaire, you can test the prototype by opening 2 tabs or windows in a browser, or windows in 2 browsers, visiting the prototype from each, and choosing the same language variety. The first player chooses a language variety. Then that player waits until another player chooses the same language variety. The server then pairs those two players. The server assigns one player to the role of “knower” and the other to the role of “guesser”. The server asks the knower to enter a password (an expression in the chosen language variety). Then iterations begin. In each iteration, the server asks the knower for a clue, the knower enters a clue, the server displays the clue to the guesser, and the guesser enters an expression in the chosen language variety. The clue must be another expression in the language variety. If the guess is the password, the players win and a round of the game ends. If the guess is not the password, the next iteration begins. After a maximum iteration count without a win, the the round ends. After a round ends, the game continues, with the knower-guesser roles inverted. Any language variety can be chosen for passwords and clues, but the interface is entirely in English. You must represent your choice of language variety with its PanLex UID (e.g., eng-000). Both the password and all clues must be single-word expressions. The maximum iteration count per round is fixed at 11. Other game ideas have been discussed and development has begun to implement them. One of the ideas is to design a game that elicits from players useful translation information that can improve the content of the PanLex database. For example, suspected translations might be given to players, who might rate their correctness. Two of the game proposals have provisionally been named “Basic Game” and “PanLexAGRAMS”. There is an archive of files documenting the ideas and containing the code that has been developed, partly obtained from a repository for the Basic Game and Password.